Almost everything I read suggested to use apples to make pectin. Well, how about that? I have an apple tree just dripping with apples right in my front yard. 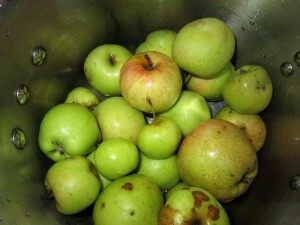 To make pectin, you thoroughly wash then quarter underripe apples (keep the peels on, don’t worry about the cores). Cover them with filtered water. Bring to a boil, then reduce heat and simmer, uncovered, for 2 hours, stirring every 20 minutes. 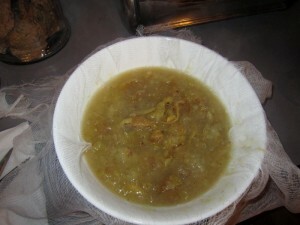 Pour the runny apple sauce into the cheesecloth. 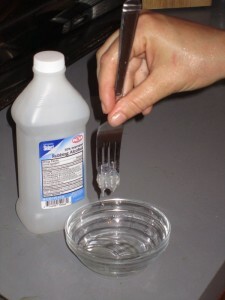 Suspend it over the bowl and let it drain/drip overnight or for several hours. 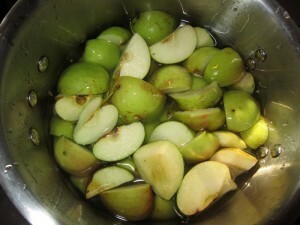 What is drained into the bowl is the pectin. 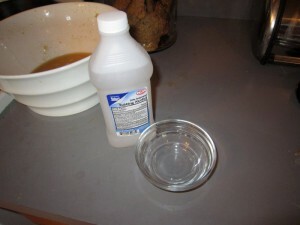 To test it, drop some into a glass of rubbing alcohol. If it gels, it works. 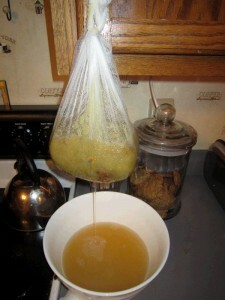 If the batch is too watery or doesn’t gel nicely, simply “reduce” it until you get the desired consistency. 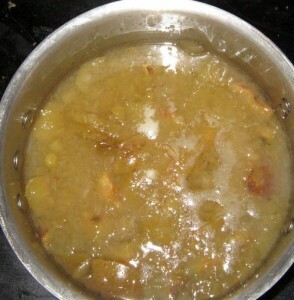 Simmer it uncovered for 30 minutes to an hour to boil off the excess water and concentrate the pectin. I had to reduce the above batch for about 45 minutes before I got the nice gel. 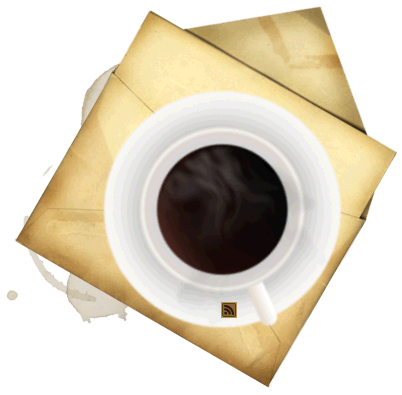 Bring to a boil and boil rapidly for 10 minutes. Pour immediately into hot, sterilized jars. Seal with rings and let set until completely cool. The jars should seal as the jelly cools. wow! that was easy…didn’t realize it was all that easy to make pectin! 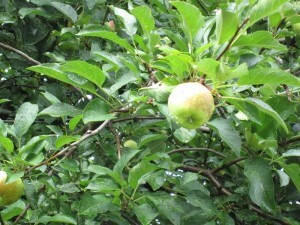 now to find some under ripe apples…. That sounds super yummy! I am going to have to try it myself. I am assuming you could subsitute any juice you wanted to produce any flavor jelly. The kids will love all of us making our own jelly! Thanks for the recipe!! I made an awesome apple butter year before last. I’ll have to see if I can find the recipe I used. 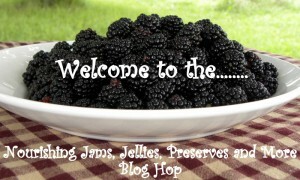 Thanks Hallee for sharing in the “Nourishing Jams, Jellies, Preserves and More” Blog Hop!! Yes it is so easy to make your own pectin. I so wish I had access to crab apples like I did when we lived in Northern Minnesota…….now they make for the strongest pectin ever and some of the best apple jellies. Miss all those trees I had access to picking all I wanted. This is one of those things I knew could be done, but hadn’t looked into yet! How easy it is — I’m truly shocked! 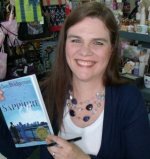 Thanks for sharing this in the blog hop, Hallee. A GREAT contribution! Thank you for this recipe. I buy lovely jams with no sugar but I hadn’t found a recipe yet. 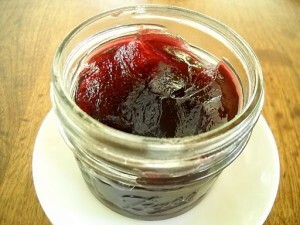 I love this idea of making my own pectin, then I see that you used honey instead of sugar. Lovely. Thank you! nice recipe, thank you. i plan to try it. I have a question about the jam recipe. many call for lemon or lime juice to make the fruit more acidic and prevent spoiling after canning. does the home made pectin take the place of lemon juice? or do grapes not require lemon juice? I don’t think grapes require lemon juice. I make grape jelly regularly, and never have put lemon juice in it. I was under the impression that the sugar prevented the spoiling, and the lemon is to help prevent the fruit from browning. But, I’m not an expert or a chemist, so I could be mistaken. We have our own grapes. Can I add water when cooking my own grapes or should I just use only grapes. We have our own grapes, honey and apples! I think I may try this, I am new to canning and jelly making this year, not crazy about store ought pectin. Wondering, however, if the home Made pectin is a direct tsp-for-tsp sub in recipes? And also how long and how to preserve it btwn uses. Thank you!